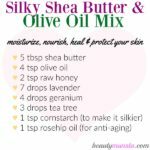 Whipped Shea Butter Avocado Oil Recipe for Skin & Hair - beautymunsta - free natural beauty hacks and more! It’s time for a unique variation of whipped shea butter! 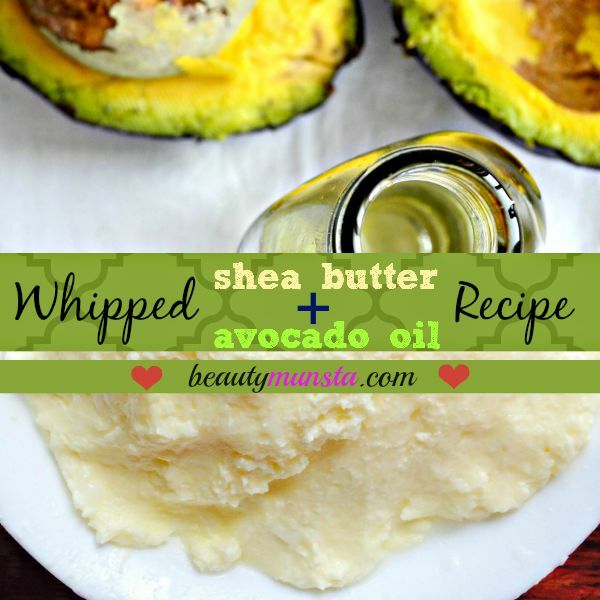 Introducing … this whipped shea body butter avocado oil recipe without coconut oil! Avocado oil has been compared to coconut oil and though it can never replace coconut oil as the multipurpose oil, it definitely is a great beauty product for both healthy skin and hair. Whipping shea butter with avocado oil creates a unique mix/blend that is extremely nourishing and healing for the skin, hair and general body. 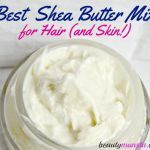 Below, I’ve listed the benefits of shea butter and avocado oil and how to make a whipped shea butter avocado recipe for beauty! Shea butter is rich in Vitamin E, which is a skin & hair healing anti oxidant. It protects the skin & hair from signs of premature aging including fine lines, wrinkles and greying of the hair. Shea butter also contains Vitamin A which hydrate and strengthen skin & hair. Shea butter contains cinnamic acid esters that give it powerful anti inflammatory properties to reduce skin inflammation. The rich fatty acids in shea butter hydrate the skin by sealing in moisture and they also promote healing and cell regeneration. Avocado oil is rich in fatty acids, vitamin A, D and E, phytosterols and a powerful substance known as sterolin, that are all great skin and hair nourishing and repairing ingredients. Use avocado oil to hydrate and moisturize your skin and hair naturally and apply it on rough skin areas and on the ends of your hair where the most damage occurs. Avocado oil is also an antibacterial and anti inflammatory agent, making it great for soothing inflammatory skin conditions. 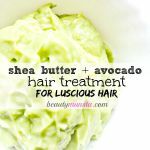 A whipped shea butter and avocado oil recipe for beautiful skin & hair! 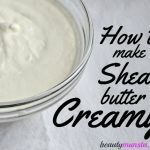 You’re going to need shea butter and avocado oil to make this whipped shea butter avocado oil recipe but I’ve also added two other ingredients to enhance this recipe and make it more lovable! Palma rosa essential oil will make this whipped shea butter recipe smell so wonderful, especially for those who you who don’t really dig the nutty aroma of raw shea butter. It doesn’t stop at the beautiful scent though, palma rosa essential oil is also a stimulant which will promote hair growth by improving circulation and it will also control oiliness in the skin & delay wrinkles and fine lines. Vegetable glycerine excellent for those of you who want to avoid using alcohol in their recipes, plus it’s a powerful antibacterial and great moisturizer. Let’s move on to the ingredients we’re going to be using and the directions to get you started! 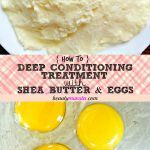 Gently melt the raw shea butter using a double boiler. Make a make-shift boiler by placing a heat safe bowl in a pan of hot water and heat it using a low flame. Once melted, stir in avocado oil and vegetable glycerin. Now place it in the refrigerator for about 5 minutes to harden a bit. Get it out and whip it using a hand mixer for about 10 to 15 minutes until you end up with a thick whipped cream-like consistency. Add 5 drops of palma rosa, stir it well and voila! It’s ready! Scrape the mixture into clean jars or containers. ➝ If you don’t have a hand mixer, you can also just try blending everything together to get a thick mixture. It works and you will end up with nice spreadable body butter!